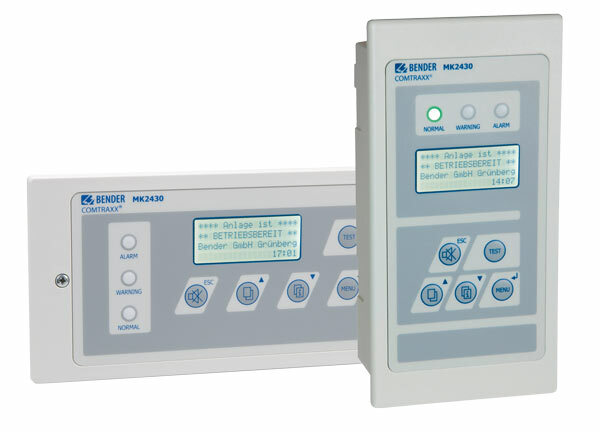 The universal remote alarm indicator and test combination MK2430 is designed for visual and audible indication of alarm messages from Bender systems such as EDS, RCMS and MEDICS. In MEDICS® monitoring systems, the MK800 meets the requirements of IEC 60364-7-710 and DIN VDE 0100-710:2002-11 in respect of test functions for IT system monitoring and alarms from changeover modules. The IT system monitoring equipment can be tested using the programmable test button. The LC text display makes this information easy to understand. The connection between the MKs and the changeover and monitoring modules is implemented with bus technology. During normal operation, the MK2430 indicates the readiness for operation of the system. The MK2430-11 features 12 digital inputs allowing messages from third party systems to be recorded and displayed on the MK2430, for example from medical gases or UPS systems. Visual and audible indication of alarm messages from EDS, RCMS and MEDICS Bender systems. During normal operation, the MK2430 indicates the readiness for operation of the system. The clear text display makes information easy to understand. Version MK2430-11 features 12 digital inputs allowing messages from other technical equipment to be recorded and displayed on the MK2430, for example from medical gases or special safety power supply sources (UPS).